If you are looking for a knowledgeable, reliable and experienced dentist in Huntersville, you have come to the right place! 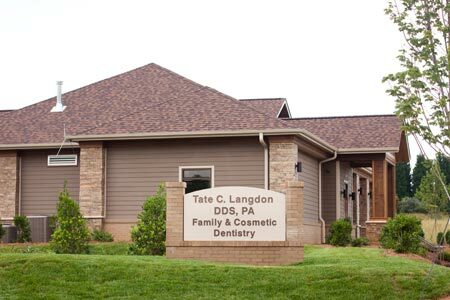 Our Huntersville dentist, Tate C. Langdon, DDS, PA, provides top-quality dental care for you and your family in Huntersville and surrounding areas. We welcome new patients of all ages. Dr. Langdon and his caring team have everything you look for in a dental practice. Our helpful and experienced team will do everything in our power to ensure you receive the best dental care available. You will experience the highest level of service at our office. Please visit our About Us page to read more about one of the leading Huntersville dentist who has a good reputation for quality and personalized care. Establishing a personal and trustworthy relationship with our dentist is the key to great dental care. Patients feel comfortable and safe receiving dental care from our Huntersville dentist. You can trust him to take the time to investigate any problems and explain everything in a manner that is understandable to you. We value open communication, and we encourage you to ask questions about your dental health. We promise to listen carefully to your concerns and goals. You can further trust that Dr. Langdon’s advice will always be in your best interest. Thorough dental care is essential to your health. Improper or inadequate dental care is guaranteed to lead to major dental health and overall health problems later. This is why prevention and education is the focus of our practice. We emphasize regular, thorough oral examinations as a preventive measure against future health issues. Our preventive health care starts with comprehensive oral exams, including regular cleaning, digital x-rays, fluoride treatments, sealants, and scaling and root planing (if needed for periodontal disease). Oral cancer screenings are the next steps to our comprehensive oral care program. In addition to preventive health care, we also offer a full range of dental services, including cosmetic and restorative dentistry. Some of our featured services include dental implants, dentures and veneers. Our team wants to help you and your families achieve your goals for a healthy and beautiful smile. Please visit our Contact Us page for location, office hours and to request an appointment at our Huntersville dental office. Please feel free to contact us for any additional questions that you may have as well. We look forward to seeing you! Please take a tour of our Huntersville NC dental office. Dr. Langdon is always welcoming new patients! Contact us for more information or to schedule an appointment.